Baw Baw Shire has successfully applied for $250,000 for soccer lighting via the Victorian State Government’s World Game Facility Fund. The funds will be used to bring match standard lighting to the Drouin Dragon’s Soccer Club and to complete the final two light towers at Trafalgar’s soccer grounds. The addition of the final two light towers is great news to both Trafalgar Victory FC and Gippsland FC. Both tenants do their best to look after the pitches throughout the season. However, with the final stage lighting to be installed prior to the 2019 season, both clubs will have much greater flexibility with pitch management as well as an opportunity to further increased participation. The “Light up the World Game” application was submitted by Shane Paynter, BBSC Recreation Coordinator, earlier this year. Trafalgar Victory FC greatly appreciate Shane’s efforts in securing this valuable and much needed funding. The funding announcement was made today in Drouin by Cohen van der Velde Director of Community Assets at BBSC, Danny Goss Deputy Mayor and Harriet Shing MP. 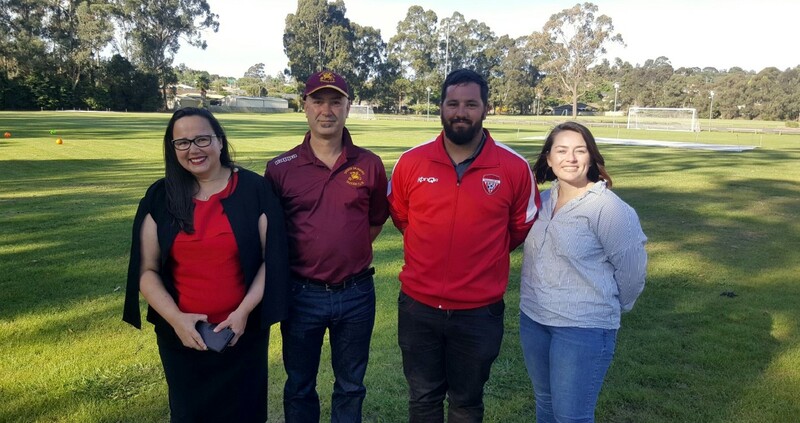 Pictured is Harriet Shing MP, Jason Beer (Drouin Dragon’s SC President), Lachlan Wyatt (Trafalgar Victory FC President) and Cr Jessica O’Donnell. Funding for the final stage lighting at the Trafalgar Soccer grounds was one of the three budget submission made to BBSC by TVFC earlier this year. The other two submission centred around the construction of a much needed change room/shower facility. To date BBSC have secured the funding for the lighting project and allocated up to $100K towards the planning of a multipurpose change room facility.